The website tracks the history of the Olympus optical company from their first camera in 1936 right through to their very latest developments. Launched in 1936, the Semi-Olympus I was the first Olympus camera fitted with the newly developed Zuiko lens, which was mounted on a Semi-Proud body supplied by Proud. It was a high-quality camera priced at 105 yen in an era when a typical starting wage was 75 yen a month. Introduced in 1973, the OM-1 was the first product in the OM Series. It earned wide acclaim as the world's smallest and lightest 35mm single-lens reflex camera. The ribbons in the cloth curtain shutter were replaced with strings, and the camera was equipped with an air damper to absorb the shock of mirror movement. The condenser was eliminated, and a pentaprism with a curved lower surface was used. Olympus employed a wide range of innovative ideas to reduce body size and the noise and shock caused by shutter operation. Shutter durability was also improved, resulting in a system capable of withstanding 100,000 operations. The finder screen could be replaced from the lens mount side. The OM-1 initially went on sale as the M-1. However, the product created such an impact that Leica asked Olympus to change the name. Olympus improved and developed a wide range of technology in preparation for the production of the OM-1, including rust prevention technology for the steel materials used to reduce weight, pentaprism processing technology, and heat treatment and surface processing technologies to maximize durability. Announced in 1988, the VC-100 went on sale in 1991 as a still video camera for commercial use. It was an analogue electronic still camera that used an analogue video camera to take still images as single frames. The images were stored on floppy disks. The CAMEDIA C-1400L was launched in 1997. This fixed-lens digital single-lens reflex camera was equipped with a high-performance optical 3x zoom lens. It was the first affordable digital camera to feature a 1.41-megapixel primary colour progressive CCD, which provided superb colour reproduction. With its amazing image quality, 1.41-megapixel resolution and 128,000 yen price tag, the C-1400L sent shock waves through the market and won numerous awards. Olympus was able to set the price at such an affordable level thanks to relentless cost-cutting efforts, led by development staff and production engineers. 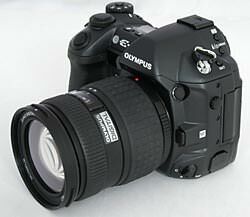 Olympus OM's were my camera of choice for years, small reliable bodies and lenses made carting them around a doddle. Despite many innovative functions - multi spot metering and OTF metering etc. They never managed to keep up with the big boys and ludicrous pricing towards the end prompted my change to Nikon brand. Still have all my OM bodies and any roll of film I take goes through them as they are a joy to use.